Are you looking for a great portable TV stand for your smart TV? With technological advancements taking place every other day, the standard 21 inch TV box has now been replaced by flat, smart televisions. Today’s latest technology has paved the way for portable TV stands for homeowners, which not only enhance the interior décor but also effectively function to set the TV in a safe and proper place in your house. 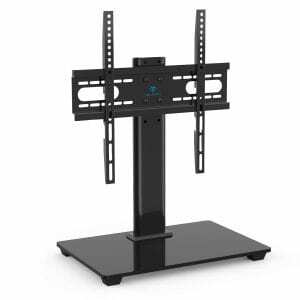 It is a misconception among most that portable TV stands are costly; not at all! In fact, investing in a portable TV stand can ensure the safety of your television and keep it secured in its place for a long time. Unlike the wall mounts for TVs, portable TV stands don’t require you to drill holes on the walls. Another great feature that comes with these stands is the height adjustability and swivel mechanism. This allows you to position the television at the correct viewing angle. This goes a long way in ensuring proper sitting posture, which eliminate back, neck, and eyestrain. Notably, some of these stands also come with rolling wheels at the base. Consecutively, instead of lifting the television, you simply need to push it from one room to the other. 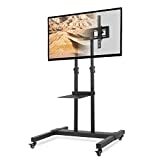 In this post, we have reviewed the top-selling portable TV stands that offer pest performance in terms of functionality, durability and a compelling look. Therefore, if you are looking forward to purchasing a portable TV stand, this is an excellent starting point. 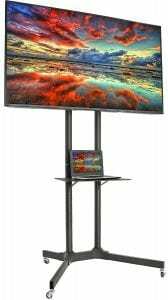 Take a look at the following 13 best portable TV stands, and you can choose the one that meets your décor and functionality requirements in the best possible way. 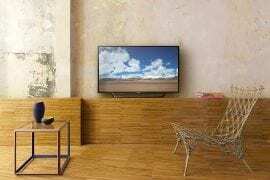 If you are a minimalist, this Fitueyes TV stand is meant for you. This stand adds height to your TV viewing to keep you from twisting your neck, and its sleek and modern design comes without any bulkiness. That does not mean that this unit compromises on the height and functionality aspects you expect from a TV stand. It can support any TV set ranging between 32 and 65 inches. Also, it comes with a smart design that incorporates 2 shelves and the ability to swivel so that you can direct the TV in any direction up to 15 degrees. This improves your viewing experience and allows you to relax while watching TV in whatever position you want. 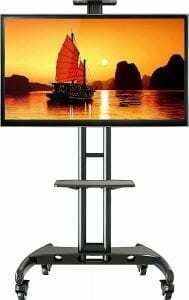 This portable TV stand by Kanto offers both support and security to a TV set sized between 37 and 65 inches. The sturdy 2-inch wheels and a durable base improve the mobility of this unit. 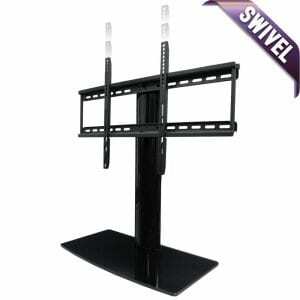 You can move the stand even when loaded with the TV set without worrying about its safety. Despite its simple and elegant design, this stand has come with a durability that lasts for years. The frame is made from top-grade powder-coated steel and it can support up to a hundred pounds of weight. The stand is also corrosion and rust resistant, making it perfect for the office and home use. 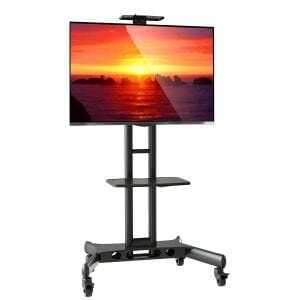 Mobility is one of the essential aspects of a portable TV stand and that is what is guaranteed in this Mount Factory Rolling TV Cart Mobile TV Stand. This compact stand prevents cluttering in your house, and its universal fit VESA mounting system is sturdy enough to hold up to 65-inch TV sets. The stand features components shelf to accommodate accessories such as gaming stations and DVD players. With a one-piece steel base, this durable stand is ideal for any television. And it can hold up to a hundred pounds without toppling over. The sturdy caster wheels make it easy to relocate this stand without breaking a sweat. This futuristic-styled compact portable TV stand is perfect for your 50-inch television that you are unable to fit into your small living area. It can take up to 70 pounds of weight and its vertical space will allow you to enjoy your TV viewing experience. This stand requires a minimum time for assembly and can be placed in dorms, family rooms, and bedrooms. 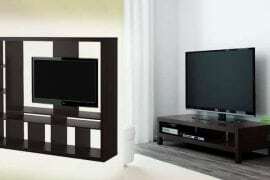 It also features two roomy and sturdy floating shelves that can easily accommodate your TV accessories. It also comes with space for accommodating bookshelf speakers in its unique design. To get maximum viewing pleasure this VIVO Black tripod stand features an exclusive 5 points for height adjustment with tilting mechanic and easy forward and backward adjustment. Moreover, the 3 touch-point tripod system adds to the stability of this TV stand. This VIVO TV stand can hold up to seventy-seven pounds of weight and TV size ranging between 32 and 55 inches. The amazing feature of height and depth adjustment allows you to enjoy your TV viewing experience without stressing your neck. Also, it is easy to assemble this stand, especially as the hole patterns are VESA compliant. This sturdy North Bayou portable TV stand comes with a base width of 29 inches and length of 34 inches. 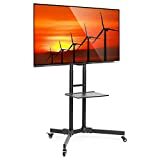 It is the most reliable and heavy-duty stand for any Flat or Curved Panel LED, Plasma and LCD television set that is sized between 32 and 65 inches. This stand can hold up to a hundred pounds. 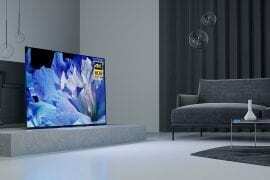 The best part is that the TV height can be adjusted from 40.5 inches to 60 inches in 2-inch increments. The patterns are VESA compliant, making it easy for you to install your TV on this stand. 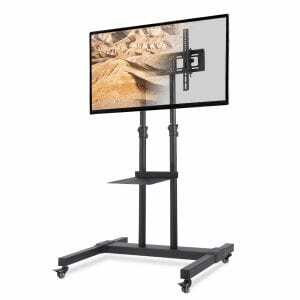 Moreover, this stand supports AV conferencing as it comes with a video tray (adjustable) and AV shelf for storing your accessories. 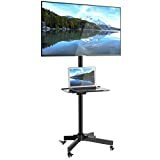 TAVR mobile TV stand is a simple and functional solution for rolling your TV around home, conference room and classroom. Combining practical design with affordability, this stand befits all styles, spaces, and budget. Users appreciate the basic design that is not only lightweight but also only space saving. Thanks to the height-adjustable design. 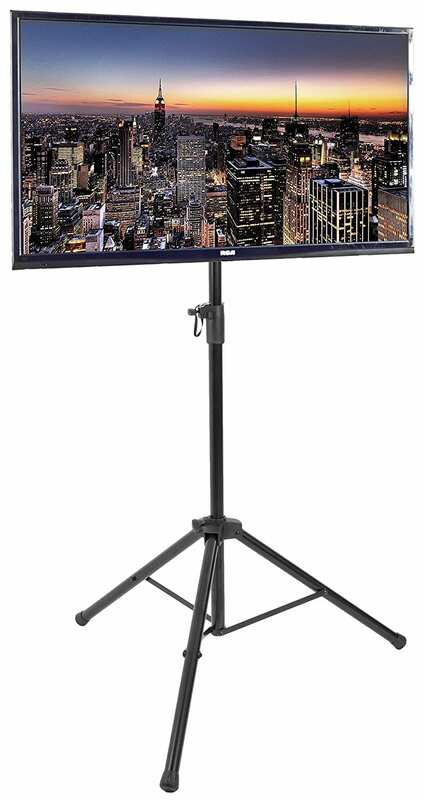 plus swivel mount, this stand customizes easily to offer an appropriate viewing angle. This feature helps in preventing neck, back, and eyestrain. 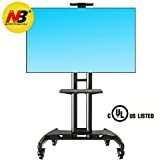 Boasting of universal compatibility, this stand is suitable for all TV brands from 32 to 70 inches. Another feature that makes this stand shine amongst the competition is its height adjustable device tray. This tray holds PVR, video audio devices or laptop, for seamless conferencing. Plus, for home use, this tray holds your gaming console, cable box as well as a DVD player bringing a tidy setup. Are you looking for a simple rolling TV stand without all the bulk and clutter? 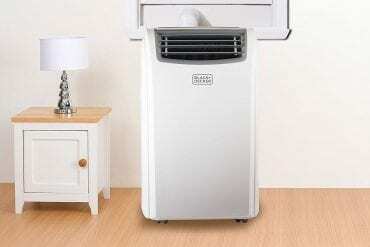 Well, this model from Mount factory comes at an affordable price, making it an ideal choice for concise budget buyers. 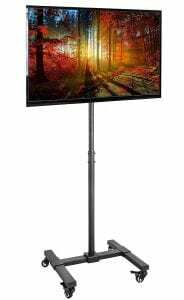 Compatible with television sets form 37-65 inches, this stand is designed to work correctly with medium to large LED, LCD and plasma television sets. Similarly, it is fitted with a bracket mount with VESA patterns, making it compatible with most flat screen panel television. When it comes to construction, users appreciate the sturdy steel frame that supports televisions that weighs up to 110 lbs. 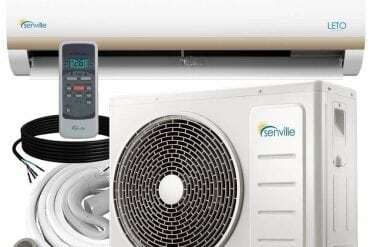 Another handy feature that makes this unit stand out is its adjustable height component. With this set, you don’t have to bring a table along to hold your laptop PVR or other digital devices when making your presentation. This feature is also ideal for home use as it makes perfect storage for your DVD player, game console, or cable box. For enhanced performance, this stand comes with swivel casters that allow for a smooth movement from one room to the other. Designed for office presentation, schoolwork, as well as home entertainment, the Aeon stand brings everything you need for seamless operation. 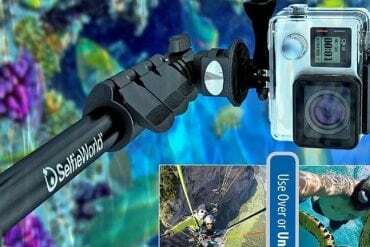 Boasting of a swiveling bracket mount, it is easy to customize the position to the best angle that lets you catch all the action. This stand offers you with a 45 degrees swivel in either direction allowing you to position the screen correctly without having to turn the base. You will also get a functional cable management system that will enable you to organize your space. While this is not a freestanding TV stand, its lightweight design makes it portable. It also assembles and disassembles within minutes, making it easy to use from home to office. Taking pride in a piano black finish, this sleek stands adds a modern touch any space. It is also worth noting that the unit comes with a bracket mount with VESA system for increased compatibility. With 1home floor stand, you don’t need to invest in a wall unit or drill your walls. 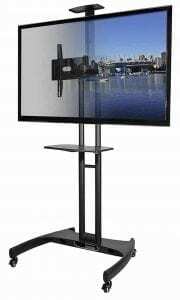 This is a modern portable TV stand design to fit any indoor space. Featuring a full functional design, this stand is effortless to use for various applications. It comes equipped with high-end caster wheels that allow to efficiently moving from one room to the other. The caster wheels also come with an inbuilt locking mechanism that ensures stability when in a stationary position. Along with a wide base construction that prevents tipping, this stand comes with a steel frame for heightened durability. Say goodbye to the unsightly cables thanks to the integrated cable management. For added convenience, this unit also comes with a standard VESA mounting bracket. This makes it compatible to most 23-55inch television sets. More importantly, this model comes with a height adjustable shelf, offering extra space to store your game consoles, DVD players, cable box and other gadgets. VIVO is a popular brand when it comes to the production of portable TV stands. The VIVO STAND-TV07W floor stand makes a perfect choice for individuals looking for a minimalist yet practical design. This stand is universally designed to work with different sized television from small to large ones. Users appreciate the lightweight design plus smooth rolling wheel. This makes it easy to move from one room to the other. The versatile design makes it an ideal choice for not only home use but also classrooms, offices, or trade shows. The wheels are also lockable ensuring that the cart becomes stationary when desired. Notably, this stand comes with a weighted base that has adjustable feet for heightened stability. While this stand doesn’t have a center tray, its center pole has 12 adjustable height points. The mount features the VESA system for increased compatibility. This is not all; the bracket has a 30-degree swivel to either side. This makes it easy to find the ideal viewing angle. More importantly, the stand features a sleek steel design that brings the right balance to durability and aesthetics. Although you may not have the luxury of space, it is crucial to ensure that your TV is secure. With PERLESMITH universal TV stand, you don’t have to drill holes on walls. This is a modern and sleek stand featuring a simple design without the bulkiness. Despite the simple design, this stand doesn’t sacrifice on practicality. 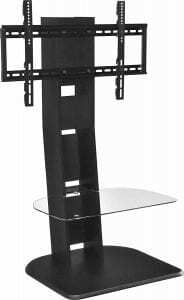 Boasting of height adjustment and swiveling bracket mount, customizing the position of your television has never been easier. Unlike other models, this stand is incredibly easy to set up. It comes partially assembled, saving you time and effort. We also love the steel and tempered glass combination that gives it an added modern touch of style. The contemporary styling complements most interior décor. Besides the impressive aesthetic, this stand is crafted from high-end materials for a solid performance. 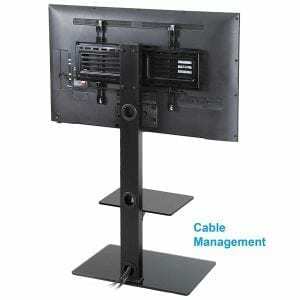 More importantly, thanks to the universal compatibility, this stand accommodates most 37-55 inch flat panel televisions. Stable, movable and sharp looking; these attributes describe this VIVO stand best. While most home and office solutions are pricey, STAND-TV03E is an affordable solution designed to up your efficiency without sacrificing a lot of your space. 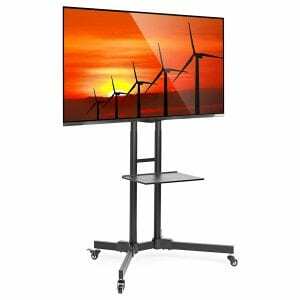 Designed to support most 32-65, LED, OLED, LCD, and plasma television, you can buy this cart with confidence. Its VESA system brings universal compatibility, making it a perfect choice regardless of your TV brand. This unit also comes with adjustable middle shelving for holding your laptop, streaming devices, DVD players and other devices. In addition, you will appreciate the integrated cable management system that helps you organize the AV and power cords. Lastly, the cart has a 15-degree swivel on both sides, allowing for better viewing angles. 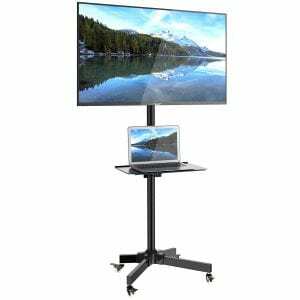 If you are new to shopping for a portable TV stand, the above-mentioned 10 portable TV stands are among the top choices rated highly by users. They are budget-friendly and have high recommendations from top online stores like Amazon. These durable and stylish accessories can easily blend in with your home décor. So, why wait? Start shopping today! Good list. I just bought a portable TV stand and it’s just great. It’s easy to assemble and transport. Also, u can store things on the shelves. And very easy to move from one place to another place.